- Play Pool: click this to play any of the 10 games either against the computer or against human opponents on the same computer. You will proceed to the Game Selection menu. - On-Line Game: To find other Cool Pool players on-line, click on the Main Menu's Online Game option. Make sure to first patch the game with the server fix patch available in the downloads section, which is a Registry Key fix for Cool Pool (and Maximum Pool) so the game will connect to the new fan-made servers (which came into existence after August 16, 2007 when Sierra shut down the public pool game servers). - Preferences: click this to access the game preferences menu (see below). Game preferences can also be accessed while playing a game through the help menu on the game screen. - Web site: the 3D Ultra Cool Pool web site is no longer in existence. Starting a game is easy with Cool Pool. 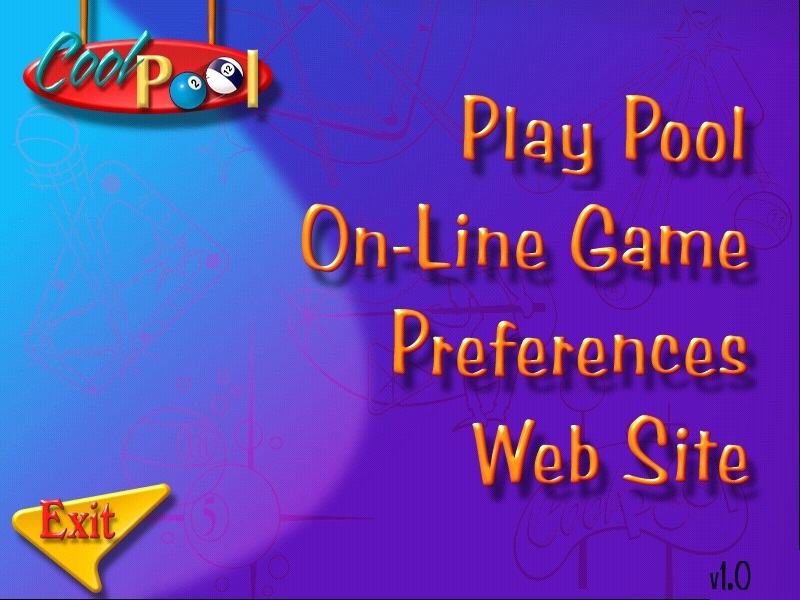 Simply select Play Pool from the main menu and then choose the game you want to play. 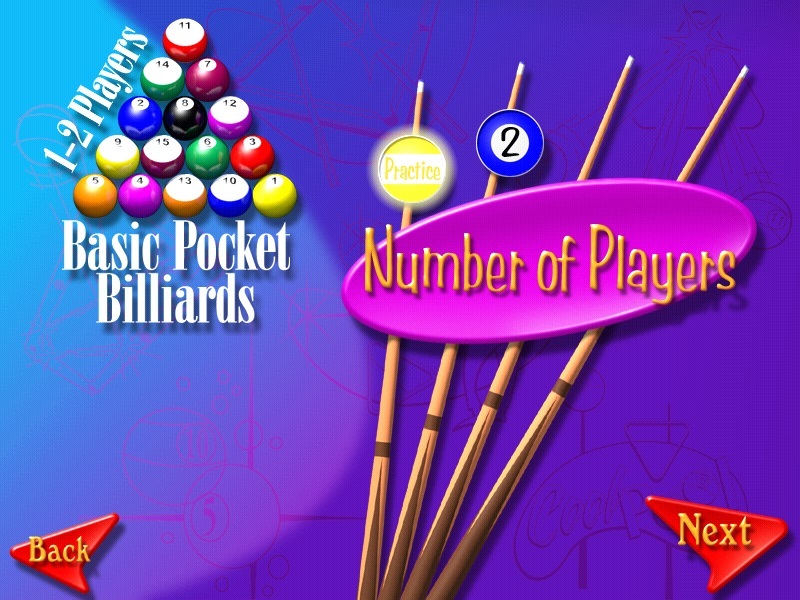 Cool Pool offers five classic games - Basic Pocket Billiards, Cutthroat, Eight Ball, Nine Ball, and Rotation. You can also choose among five completely new cool games that are possible only on a computer. And, each new game can be played on a standard rectangular table, or a uniquely shaped cool table. To choose a game from the Game Selection menu, click on the type of game you want to play (Classic Games; Cool Games, Standard Tables; or Cool Games, Cool Tables), select the game from the list that appears on the right, and click Next. You can check out the rules to the selected game by clicking on the Rules button before you click Next. The number of players the game supports is shown in the game logo in the upper left corner of the window. After you select a game to play, you must set the difficulty level, choose the number of players, and enter each player's name. The difficulty level determines how the game's unique target ball works. The target ball is slightly see-through and has a small red bull's eye on it. As its name implies, this ball acts like a target, and you place it on the table at the spot you want the real cue ball to go. You move the target ball by pointing at it with the mouse, pressing the left mouse button, dragging the ball to the desired location, and releasing the mouse button to drop the ball. Even if you aim by moving the cue stick, the target ball automatically moves around the table to show you where the cue ball will end up. EASY: In easy, the target ball can move clear across the table to help you line up shots. MEDIUM: This level keeps the target ball a little closer to the cue ball. HARD: The hard level keeps the target ball on a tight leash. BACK: Click here to go back to the Game Selection menu. NEXT: Click here to continue to the Number of Players menu. The next menu asks you how many people will be playing. PRACTICE: Click here to play a game by yourself against one or more sharp-shooting computer opponents. 2 - 4: Click on the number of players you want in the game. The number of possible players depends on the game you've selected. Cutthroat, for example, can be played with three players only. 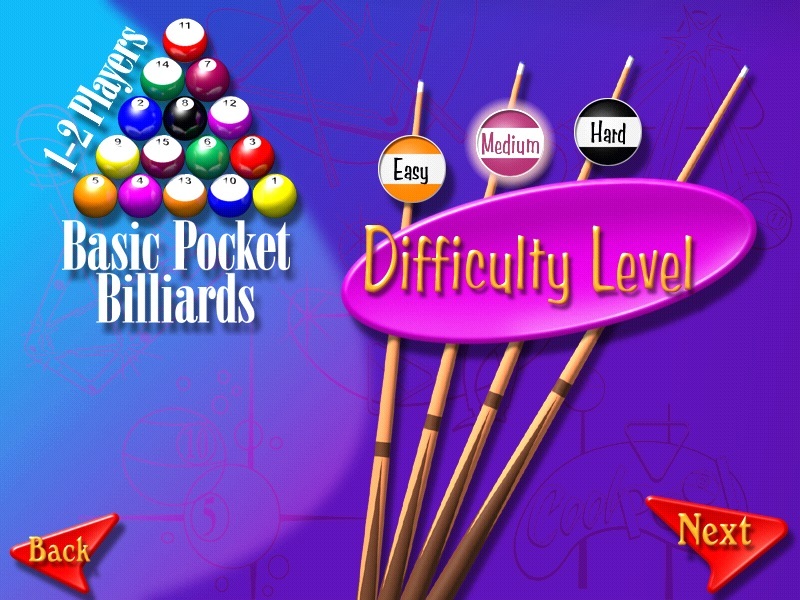 BACK: Click here to go back to the Difficulty Level menu. NEXT: Click here to continue on and enter each player's name. The next screen lets you enter each player's name. Once all the names have been entered, the game begins. Click on the main menu's Preferences option to customize the game. 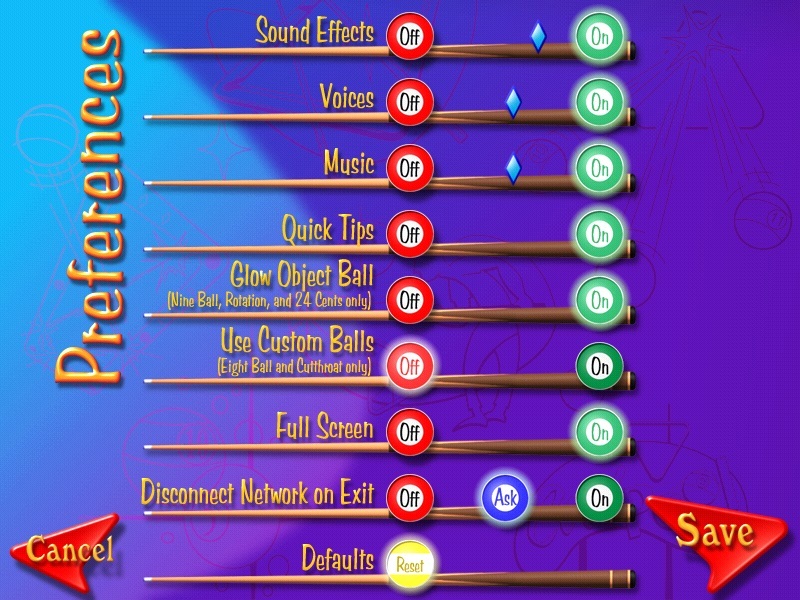 Music, sound effects and voices: click the On or Off buttons to turn on or off the game's music, sound effects, or voices. Click on and move the small diamond-shaped button that appears over the cue stick to adjust the volume. Quick Tips: You can turn off Quick Tip (short instructional tips that appear before each game) by clicking the Off button. Click On to turn them back on again. Glow Object Ball: Turn this on to make the low-numbered ball(s) glow in when playing Nine Ball, Rotation, and 24 Cents. 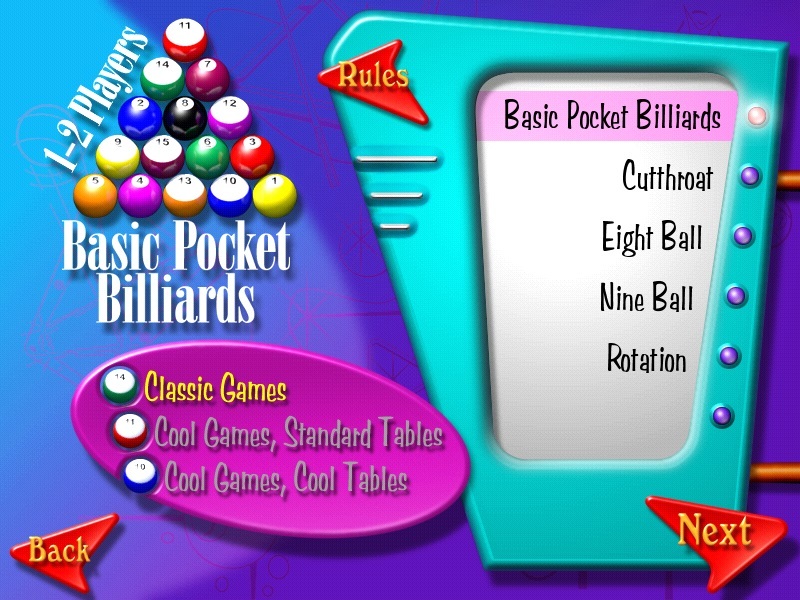 In each of these games, you must hit the lowest numbered ball on the table before hitting any others. Use Custom Balls: To make it easier to see which balls are yours in the games Eight Ball and Cutthroat, click On to activate Cool Pool's custom balls. In Eight Ball, the striped balls are all green and the solid balls are all red. In Cutthroat, the balls are separated into groups of red, green, and blue balls. Click Off to use a traditional set of balls for these games. Full screen: For smooth ball movement and super-responsive mouse control, click the On button. This will switch the game into full-screen mode and help the game run much more efficiently. If you prefer to run the game inside a window, click the Off button. You can run the game in a window only if you have a 1024x768 or higher desktop resolution. Network Disconnect on Exit: (no longer in use.) Turn this on if you use dial-up Internet connection and want Cool Pool to automatically disconnect from your ISP when you exit the game. Defaults: Click on this button to change the preferences settings to the way they were when you first installed Cool Pool. Cancel: Select this to leave this menu and cancel any changes you've made. Save: Click here to leave this menu, saving any changes you've made.